What is the Motivation for Your Practice? – Love. Life. Practice. The Maze or the Cheese? I enjoyed relaxing yesterday morning with a TED Talk by Dan Ariely about the motivation for work. Much as Daniel Pink talked about in his book Drive, it turns out the old Skinnerian behavior models don’t work so well in the knowledge economy. People don’t seem to want to work just for pay, especially if they don’t get to see their work applied to some higher meaning. In the experiments Ariely describes, people are given relatively mundane tasks (assembling legos) but are paid less and less with each consecutive assembly. For some, the assembled pieces are stored, with the implication that somewhere there is a stack of completed models. Maybe they’re part of a gallery! An animated army for a film! Gifts for a children’s hospital! Not that any of those possibilities were mentioned; I simply could imagine the subjects thinking that as they assembled model after model for less and less pay. On average, people were willing to assemble eleven models before the pay-to-work ratio fell too low. For other subjects, once a model was assembled it was immediately disassembled in front of them. Everything else was the same – they were still offered the chance to assemble another one for less money. Each time they completed it, the model was simply taken apart right in front of them. Unsurprisingly, when faced with this kind of meaningless repetition, they were willing to assemble far fewer lego models. Except according to the classic model of economics they should have been just as willing to perform the task, since the money involved was the same. Nope – turns out that it’s not the cheese at the end that motivates the rats, but it’s also the trip through the maze itself. What is the motivation for such attention to process? As I read about the experiment, I found myself thinking of it from a zen perspective. If I were doing that experiment, perhaps I would try to find the most efficient way to assemble the pieces. I would examine my movements, trying to combine form and function into a level of grace similar the Japanese tea ceremony. Have you ever seen one? It is one of the most beautiful practices I’ve ever seen, ever since I first saw it in The Karate Kid II. 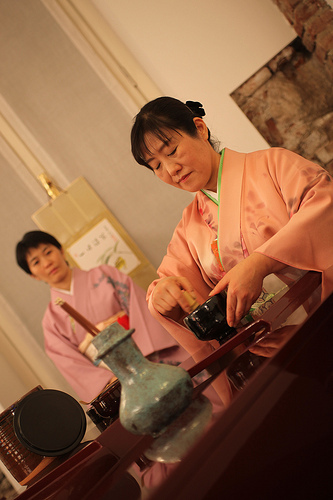 But I think my fantasy of how I would do the study has one major flaw, and it’s also related to the tea ceremony. The first time I was able to participate in one, I had to go through a training class. Not to perform the ceremony – to learn how to appreciate it, to be trained in the proper ways to show that appreciation. It wasn’t enough for me to simply watch, or simply drink the tea that was presented. I needed to be aware of what the various parts of the ceremony meant, why they were done the way they were done, and how to complete the act of thanks. With the legos, the only person who would actually appreciate my progress was me. And while I am certainly egotistical enough to occupy my attention for a while, at a certain point even I tire of myself. Ariely actually backs up this observation with another experiment, where he discovered that even a token glance as some meaningful paperwork accompanied by an approving “Mm-hmm” can make a huge difference in how willing people are to do work. With any kind of new habit or endeavor or practice, I believe it is essential to determine what your motivation is for taking it on. Too often we conflate “reasons” with “motivation”, and they are not the same thing. I exercise because I want to maintain the ability to move and play with my grandkids. That’s a great reason, but is it a motivation? Not really, because when the couch and TV and donuts are beckoning I’m not usually around the boys. On the other hand, when I’m lifting Harvey out of his car seat and I get that warning twinge in my back, suddenly I am motivated by fear – but of course, at that point I’m nowhere near the exercise center. It’s like the old saw about the man with a hole in his roof that lets the rain in. Why doesn’t he fix it? Because when it leaks, it’s too rainy to be up on the roof, and when it’s not raining, well, it doesn’t leak, right? Almost everything I do suffers that same problem. I hate writing, but I love having written. I hate yoga, but I feel great when I’ve done it. I hated my dance technique classes, but I loved the feeling of applause after a performance. I hate doing SEO, but I love looking at my Google Analytics. For the most part, the motivation behind the successful practices has been the reward after – which Mr. Ariely would also be unsurprised at. He uses the example of mountain climbers, who suffer frostbite, hypoxia, falls, danger, and worse, just to get to the top of a mountain. When they go back down, what do they do? Usually plan their next ascent. It’s not the maze itself, it’s the meaning they find by going through the maze that is the reward. But isn’t the view from the top sort of the “cheese” reward? Aren’t my blog posts the reward of writing, and my being able to go upstairs easily the payoff for the yoga and elliptical? The answer is yes, of course – but it’s not usually what you think it is when you start the journey. I began yoga hoping to look like Rodney Yee. I started this blog with the hope of making a living from it. Guess what? I look more like Harvey Keitel. And my initial investor is still waiting on his ROI. But what I have is a body of work, in both senses of the word, that I can look at and benefit from, as well as share with others. And I still exercise, and I still write, but not for the cheese I thought I was getting. If you’re in the maze, find the right cheese. It will make the journey much, much easier.